Senior PLO official hopes Israel will halt construction in Judea and Samaria but does not make that a condition for talks. Senior Palestine Liberation Organization official Saeb Erekat on Sunday said he "hopes" Israel will halt construction in Judea and Samaria if U.S.-led peace talks resume. At the same time, he stopped short of making a halt to “settlement construction” a condition for talks. Erekat was quoted by The Associated Press as he spoke in Jordan after meeting with the foreign ministers of Jordan and Egypt, ahead of a Middle East trip next week by President Donald Trump. 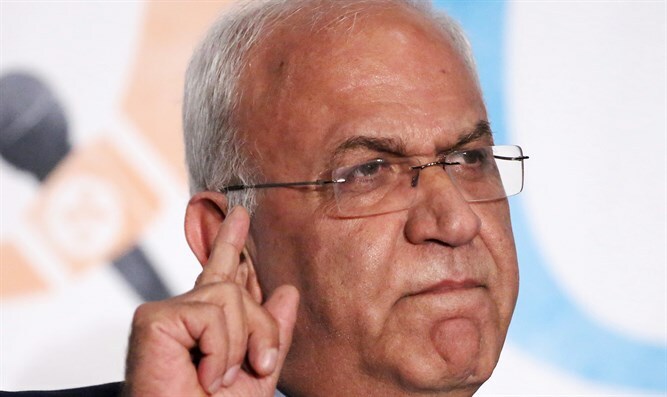 Asked about linking negotiations to a freeze in Israeli construction, Erekat said "no one stands to lose more in the absence of peace and negotiations" than Palestinian Arabs. His comments come ahead of a visit to the region by U.S. President Donald Trump. National security adviser H.R. McMaster said on Friday that Trump “will express his desire for dignity and self-determination for the Palestinians" when he meets PA chairman Mahmoud Abbas. In the past, Abbas has rejected calls by Israel to sit down for direct negotiations, choosing instead to impose preconditions on such talks. One of those preconditions has been for Israel to freeze construction in Judea and Samaria. Israel-PA peace talks have been frozen since 2014, when an initiative by then-Secretary of State John Kerry failed after the PA unilaterally applied to join international institutions. Trump has made clear that he intends to work towards a peace agreement. His Middle East envoy, Jason Greenblatt, recently said an agreement will require serious compromises from both Israel and the PA.